Component Object Model (COM) is Microsoft's object-oriented programming model that defines how objects interact within a single application or between applications - specifying how components work together and inter-operate. COM is used as the basis for Active X and OLE - two favorite targets of hackers and malicious programs to launch attacks on your computer. It is a critical part of any security system to restrict processes from accessing the Component Object Model - in other words, to protect the COM interfaces. Comodo Internet Security automatically protects COM interfaces against against modification, corruption and manipulation by malicious processes. 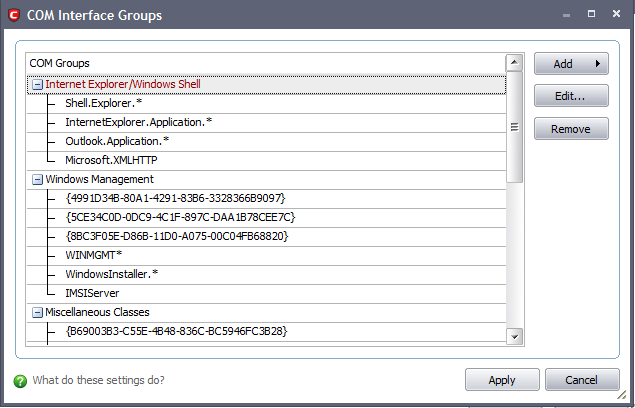 The predefined COM Interface groups can be accessed by clicking the 'Groups...' button. 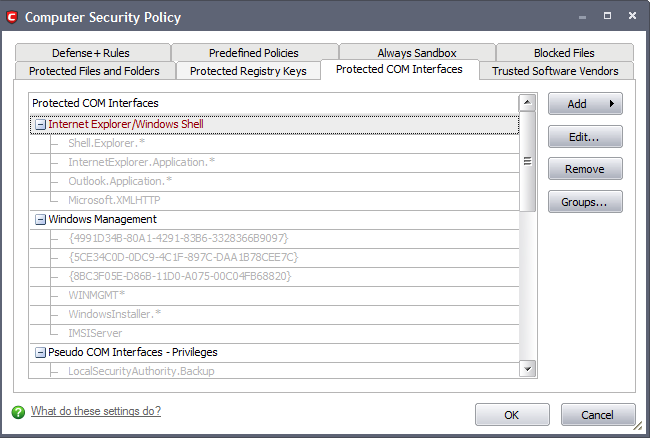 In order to access 'Protected COM Components' Interface, navigate to: Defense+ Tasks > Computer Security Policy > Protected COM Interfaces. You can import additional COM interfaces that you wish to protect by clicking the 'Add' button. The 'COM Groups' option allows you to batch select and import predefined COM interfaces. The 'COM Components....' option allows you to add individual COM components. You can add items manually by browsing the components in the right hand pane. 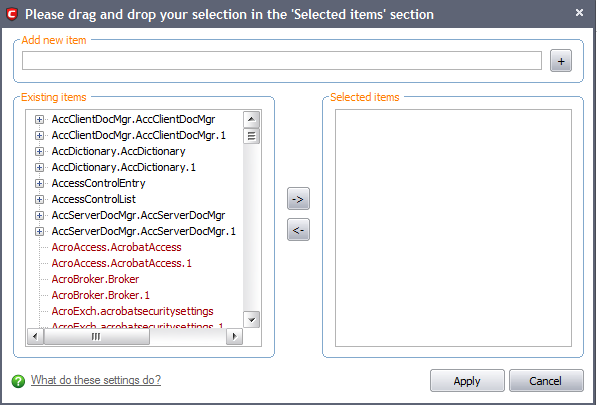 Drag & drop specific components into the 'Selected Items' pane. To add manually add a component' enter its name in the field and press the '+' button. Click on the 'Groups' button. COM groups are handy, predefined groupings of COM interfaces. Create a new COM Group by clicking the 'Add' button. Edit the names of existing COM Group or individual component by right-clicking and selecting 'Edit'. Re-assign COM components to another group by dragging and dropping. Comodo Internet Security User Guide | © 2012 Comodo Security Solutions Inc. | All rights reserved.